They were put up for sale on the GAA’s website. Some fans would take any kind of ticket at this stage. 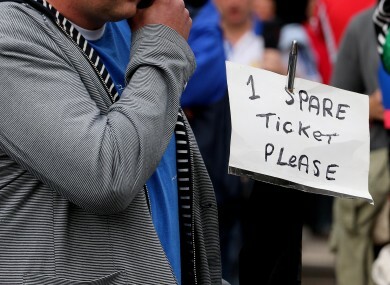 THEY’RE NORMALLY LIKE gold dust, but last night unwanted All-Ireland hurling final tickets were returned by the Kilkenny and Tipperary county boards to be sold online by the GAA. Despite both the Tipperary and Kilkenny GAA county boards claiming that there would be very little demand for these less desirable tickets, some of which being in restricted viewing sections, fans have questioned the decision to put allocated tickets on sale outside of the competing counties. Tipperary County Board said that ‘these are isolated tickets in the back rows, and some are restricted viewing where very few would go. “It will sell out there’s no doubt about that and there’s a huge demand around the county and in Dublin. Last night there were both upper Hogan and Cusack stand tickets available for purchase on gaa.ie, some of which being available at the reduced €40 for ‘restricted viewing’, although a number of regular €80 stand tickets were also available. These were all sold before today. A spokesman for Kilkenny GAA added that he was initially surprised by the news as there were a number of people still looking for stand tickets, although the GAA’s statement did not represent the situation in the county accurately . Nonetheless he did reveal that the Kilkenny county board have returned a number of Nally terrace tickets, along with two “restricted viewing stand tickets, behind the screen which cost €40. Email “Kilkenny and Tipp county boards returned unwanted final tickets last night”. Feedback on “Kilkenny and Tipp county boards returned unwanted final tickets last night”.